The picture above shows the central chancel: Buddha in the centre represents by two statues. The big gold represents the Enlighting One in his classical posture of meditation and two devotees guard him. The white small statue represents the Compassion to the world and Buddha`s oath to help every person who needs is. The whole altar group designed the way people could feel both the high will and attention to the particular person. We was lucky to visit thet place 2 days before the Middle Autumn Festival so we had our space to think and saw in quiet. That seria of pictures show what`s inside the temple. There are several pavilions on the territory of the temlpe rounds by wall. Every pavilion dedicate for different purposes with special environment inside. You can see statues of Buddha`s students here on the picture. Every figure has an individual features such as posture, hand`s gestures, face expressions. Although all figures has the same sitting position (the same as Buddha) they seems lively and different from each others. All statues is bigger then human size. A big gold-yellow construction seems the same as China Emperior`s baldachin. That Boddhisattva sits on a lion and holds a rod with the same fitures (top, angles) as Chinese traditional Wish Fulfilment staff. Chinese "lions" is one of the most interesting thing in sculptures. They looks so lively and funny, with so unaffected expression on faces so represents a contrast to classical expression of saints. During thet Chinese Adventure period I catched a thought that we, europeans, could have very different understanding of chinese lion`s (also tigers and others predators) expression. May be they represents straight, sometimes aggression (tigers) of they are a guardians. But I stuck with association with pekines, small funny brave dogs, which has the same faces and same expressions sometimes. With all respect that one lion represents on the picture in my mind sounds the voice of the Wolf in "Shrek-I" animation. 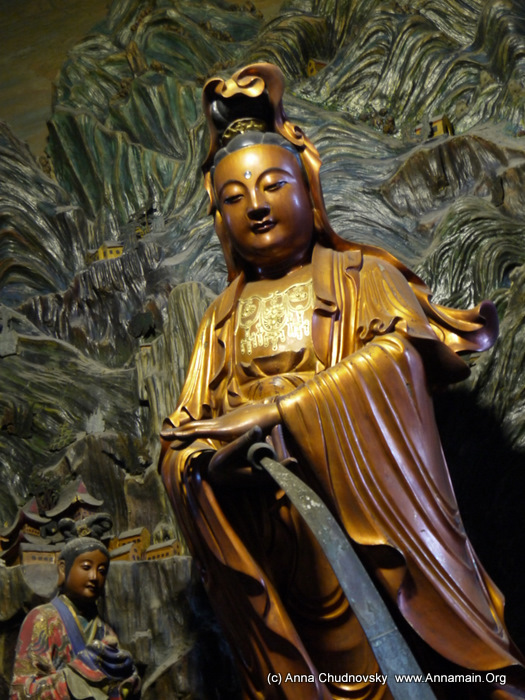 This is Guan In - the First Buddha Avalokiteshvara feminized in China into beautiful image. I was lucky to saw monks of thet temple. You can see a high rank buddhists prist with his uniform. Next post I will publish pictures about environment of the Temple, so peaceful and beautiful.